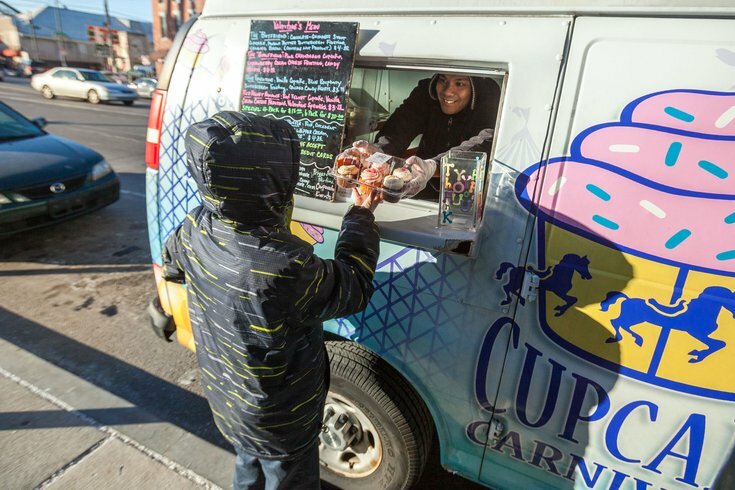 Jeffrey Jimenez, owner of Cupcake Carnivale, vends at the corner of Frankford and Girard avenues. With former City Councilman Jim Kenney poised to become the next mayor of Philadelphia, food truck vendors believe his supportive stance toward small businesses will be a victory for the industry. Rob Mitchell, newly named president of the Philadelphia Mobile Food Truck Association, says that Kenney could be willing to push for expansion of a bill passed in April that revised the city's definition of food trucks and tailored zoning permit regulations to make it easier for them to operate. With newly granted permission to operate in private lots, for instance, mobile vendors can now set up shop at private catering events. But food trucks are still prohibited from doing business in pedestrian rich Center City, an area highly coveted by truck vendors like Mitchell, who also owns The Cow and the Curd food truck. According to the Philadelphia Business Journal, Mitchell is confident Kenney will be receptive to further changes to the city's legislation. This year has already seen major strides for mobile food vendors in the city. Prior to the April update, the terms "peddler" and "transient" were still included in the definition. Under the new law, only "pushcarts" are expressly prohibited from serving as "self-contained food service operations." With Kenney in their corner, food truck vendors may make their way to a lucrative new market.